Rheumatoid arthritis (RA) affects 1.3 million people in the United States, according to the American College of Rheumatology. It is the most common autoimmune form of inflammatory arthritis. RA is caused when your immune system (your body’s defense system) stops working and attacks healthy cells because it believes they are unhealthy. It often causes pain and swelling in the small joints of the hands and feet, but can affect any joint or organ of the body. RA can affect anyone of any age and there is no cure for it. Treatments include aggressive medications, lifestyle changes, complementary therapies, and in some cases, surgery. If you have a severe form of RA, it is possible you may qualify for social security disability benefits. Social security disability payments help when you are no longer able to work due to a serious illness or disability. To qualify for disability benefits, you will need to show the Social Security Administration (SSA) that you are no longer able to perform a job consistently. And if your joint pain or any deformities make it difficult and impossible for you to do your job, you may qualify for disability benefits. The SSA website has section called the Blue Book. The Blue Book lists all the medical conditions that may qualify a person to receive disability benefits. Repeated flares of RA, with at least two major symptoms, such as severe fatigue, fever, malaise, or involuntary weight loss, that cause limitations in daily living, social functioning, and the ability to complete tasks correctly and timely due to concentration difficulties, exhaustion and physical limitation. When you decide it is time to apply for disability benefits, your doctor will need to provide medical proof of your disability. 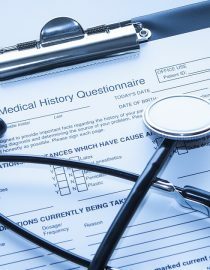 The decision as to whether you qualify for disability benefits comes down to your doctor proving and documenting you are unable to do your job. So, if you are having trouble doing your job, for example, if you are an administrative assistant and you struggle to type due to swollen and deformed fingers, you should have a conversation with your doctor. If your doctor agrees with you that you are unable to do your job, ask for a copy of your chart to provide when putting in your actual application. If for some reason your doctor’s chart isn’t sufficient enough to get you approved for disability, or your doctor doesn’t agree with you, call your insurance company and ask for a referral to a doctor who can complete an independent exam. The SSA needs numerous pieces of information so you should gather those before even starting your application for disability benefits. It takes up to five months to process your application, but you can make the process easier by making sure you have all the necessary documents and information when you apply, including medical evidence. SSA has two programs you may qualify for: Social Security Disability Insurance (SSDI) and Social Security Income (SSI). SSDI is a disability benefit for people who have paid in the system and have enough earned work credits, which is at least 5 to 10 years of employment. SSI, on the other hand, covers people who have limited income or who do not have enough credits to quality for SSDI. Once you have all your paperwork ready, you can visit your local SSA office to apply for disability benefits. You may apply online for SSDI. If you are approved, you will receive an award letter from SSA advising when you would start receiving benefits and the monthly amount you will receive. You might also like...Are Nightshade Vegetables Really Bad? If the SSA denies your application for benefits, you have the right to appeal that decision within 60 days of receiving the denial letter. At that point, it makes sense to obtain the assistance of a disability attorney. An attorney can help you through each step of the appeals process and present your case at a disability hearing. You have a better chance of approval with the assistance of legal representation than you do on your own. If you decide to hire a lawyer, there is no upfront cost to you and legal fees are set by the SSA. Once you win your appeal, your lawyer’s payment is 25 percent of your retroactive benefits (the backdated amount you are entitled to starting at the date of your initial application) and the SSA will pay your attorney this amount directly. There are ways to keep working with rheumatoid arthritis, but it takes a few lifestyle changes from taking short breaks to managing symptoms. I believe it. They are wicked. Translation is not what she was trying to say. She is saying that now that she is single, she does not have help for herself.